With its array of bike paths and routes to suit all activity levels, it’s easy to see why many people consider Canberra cycling nirvana. 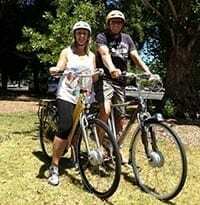 The only way to make cycling even more fun in Canberra is to do it on an electric bicycle! Ride around Lake Burley Griffin or cycle through the city and take in the sights such as Parliament House (old and new), the War Memorial and the Australian National Botanic Gardens. Or, if you’re feeling keen and like hills (you’ll like them more with an electric bike! ), tackle the summits of Black Mountain, Mt Ainslie or Red Hill. How do you get your hands on the perfect electric bicycle for your needs at a competitive price? Easy, just give Melbourne Electric Bicycles a call. We’ll thoroughly discuss your specific needs and requirements and match you with the perfect bike. With our large range of electric bicycles, there’s a bike to suit everyone. Why choose Melbourne Electric Bicycles? We’ll provide free delivery to Canberra. Or, if you prefer to travel to Melbourne to visit the store, we’ll discount any electric bicycle you choose by $100 to cover part of your costs*. Conditions apply. We don’t just sell bikes; we fit bikes to each individual’s measurements, needs and requirements. Most of our bikes come with the peace of mind of a 2-year manufacturer’s warranty. To ensure your safety and enjoyment, we calibrate the gears and adjust the brakes and other parts in our workshop before delivery. Not all suppliers provide this service. A bike bought from us and delivered to Canberra will be virtually ready to ride. Generally, all you will need to do is fit the pedals and straighten the handlebars. With many other suppliers you’ll need to do a lot more assembly than this. So what are you waiting for? Contact Melbourne Electric Bicycles and we’ll have you riding an electric bicycle quicker than a politician can deliver a promise!